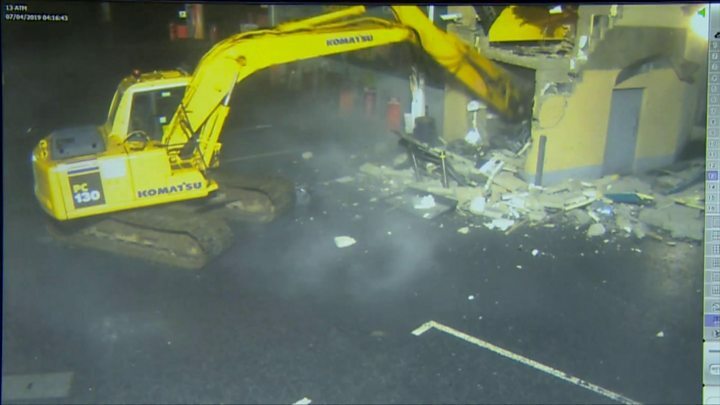 CCTV footage showing a stolen digger being used to rip a cash machine from the side of a shop in County Londonderry has been released. The footage shows the digger driving through a security gate then tearing the machine from the wall. The cash machine was lifted into a Citroen Berlingo car which had part of its roof cut off. A number of masked men are seen in the footage. The raid lasted just over four minutes. Afterwards the car was driven away with the cash machine sticking out of the roof. It is the latest in a series of cash machine thefts on both sides of the Irish border, with the Police Service of Northern Ireland (PSNI) saying it was the eighth such incident in 2019. There have been eight cash machine robberies this year in Northern Ireland, mostly in rural areas, and police believe at least two gangs are involved. The PSNI says there is no evidence paramilitaries are engaged in the raids directly, but they make take some of the proceeds. In February, police established a special task force drawn from officers within its organised crime branch, while patrols have also been increased in areas deemed to be vulnerable to attack. So far, one person has been arrested. Cracking down on the robberies is currently a top priority and the PSNI is working closely with police in the Republic of Ireland.